That was the defense Bulls coach Tom Thibodeau has been talking about. And, frankly, it continues to be remarkable that the Bulls, without any elite level individual defender, can shut down a top team as they did Saturday in the United Center in defeating the Eastern Conference leading Boston Celtics 90-79. 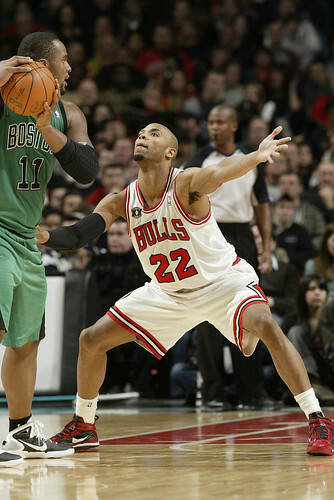 It was a brilliant defensive effort for the Bulls against the best shooting team in the league, the Celtics averaging 50.5 percent coming in. Boston shot 37.8 percent, which accounted somewhat for a Bulls 48-27 rebounding edge as the Bulls had a load of Boston half baked jumpers to digest. But it was more how the Bulls, now 24-12, did it in a somewhat mirror image game. Thibodeau coached Boston’s defense in their run to a championship and seven game Finals loss last season, and, sure Kevin Garnett was out. 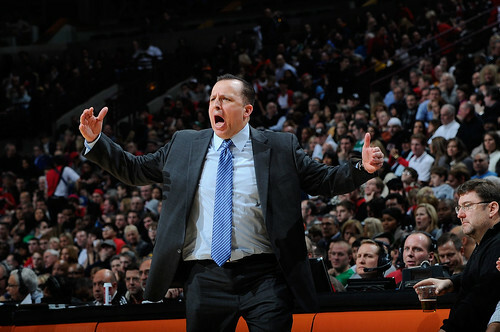 But Thibodeau brought the Boston principles with him to Chicago, and the Bulls simply did it better. The result was quieting Ray Allen, who couldn’t get a shot off in the fourth quarter, and Paul Pierce, who attempted just one in the fourth while Glen Davis attempted nine of Boston’s 17 fourth quarter shots while the Bulls pulled away after leading 67-64 to open the fourth quarter. But for all the Celtics, now 28-8, talked about how badly they played, it was the Bulls who lured them there. The teams employ similar defensive principles, pushing the pick and roll baseline, protecting the middle to form a sort of shell, guards stunting from the elbows, attacking the pick and roll with the big man and recovering, through more of a blitz from the power forward than center, getting help from the big man on baseline screens. 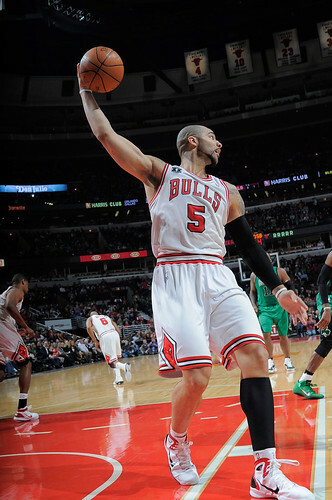 Such was the case with Carlos Boozer, who was benched in the loss to the Nets Wednesday. 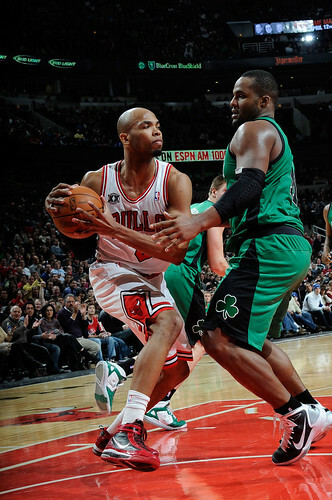 Boozer had 22 points and 10 rebounds, but his defense was particularly sharp. He is not naturally a great defender, but he apparently took whatever message, if there was one. Boozer fought Davis for position and pushed Davis farther out for his shot, which usually is very good. Davis was a woebegone four of 17 and three times got laid out or virtually knocked cold by Boozer elbows. Inadvertent, of course. “He was playing his game and I was playing mine,” said Boozer with a smile. 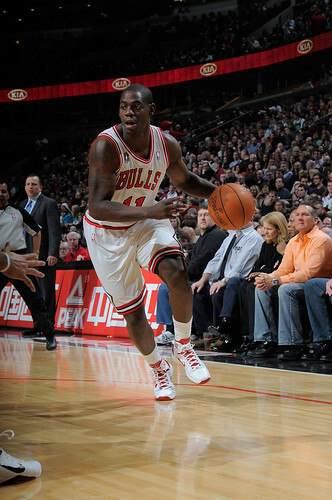 The Bulls tag teamed Allen in the fourth quarter with first Kyle Korver and then Ronnie Brewer, the latter with another strong game with 10 points, six rebounds and two steals. “For me, it’s just to go out there and provide a spark,” said Brewer, whose highlight play was a pickpocket of Marquis Daniels, a dive to beat him to the ball and leap to his feet for a fast break that ended in Boozer free throws for a 71-64 lead early in the fourth. “Coach allows me to go out there and gamble a little more on defense than he used to. 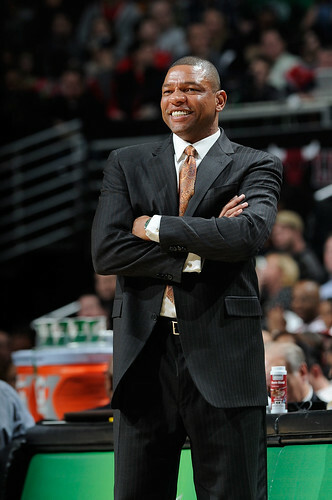 I just try to be solid and make it tough on Ray Allen and make hustle plays and I felt it propelled our team tonight. Korver did this well to open the fourth although he is not known for his defense, and Brewer picked it up a few minutes in. They almost were face guarding Allen, or bodying him when he tried to go to the post as the Celtics like to run smaller players in the post. Lacking that, the Celtics will run Allen along baseline screens, which I’d like to see more of for Korver on offense. Everytime the Celtics did, the Bulls big man in that spot stepped out to deny Allen curling, and then either Boozer or Kurt Thomas was able to get back, the kind of read and react defense the Bulls weren’t playing much on their recent road trip. 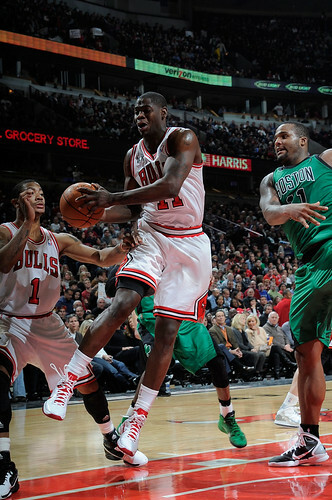 On the other side, Luol Deng, who played through the flu, had just nine points and added nine rebounds. But he similarly squeezed Pierce as the Bulls funneled everything toward Davis or one of the Celtics other big men, Shaquille O’Neal or Jermaine O’Neal, neither of whom could do much as they don’t look like they are skipping desserts these days. The Bulls started to pull away midway through the fourth quarter and dominate on the boards, so Rivers went back to Shaq. 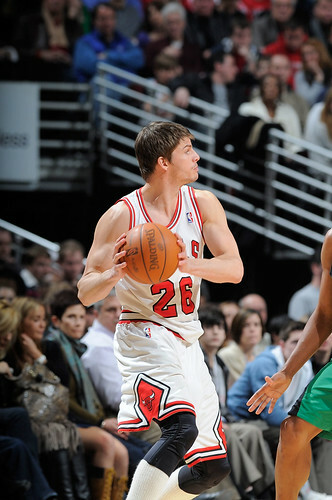 But the Bulls responded immediately with Thomas and putting Shaq in pick and rolls. Shaq didn’t play them when he was in shape, and Rose scored two quick baskets with Shaq laying off and Rivers quickly replaced him with Jermaine with the Bulls moving ahead 80-70 with about five minutes left. Thomas stayed in the game and after a rough week took on sort of the role Joakim Noah often plays. Though Noah is known for his rebounding and court speed, he is an excellent passer, probably the Bulls best playmaker after Rose. 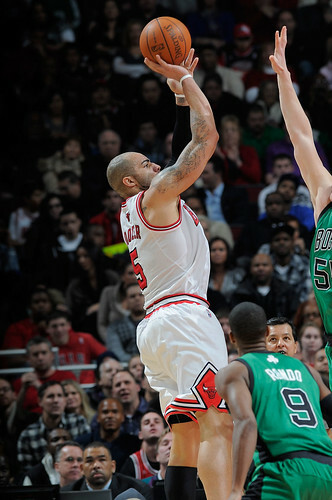 It’s another reason the offense staggers more now as few Bulls players can truly make plays. But Thomas, who finished with eight rebounds and four blocks, made back to back brilliant passes for assisted baskets with the Bulls ahead 81-70 with 4:40 left. The Bulls had gotten those last two points on free throws after Thomas stripped Jermaine and Boozer ran out. Rondo tackled Boozer to prevent the layup, but held Boozer up in a sporting play. Yes, Rondo, who had a quiet 13 points, eight assists and five steals. 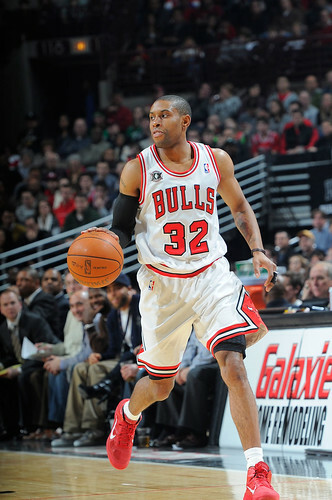 And aside: C’mon, he’s going to start the All-Star game ahead of Rose? But it is the voting of mostly Americans, and you can never underestimate the ability of Americans to make the wrong decisions. Anyway, back to our happy story. First, Thomas shot a laser pass to Deng underneath for a layup as Rose was doubled. On the next possession with Thomas playing the high post, though a bit higher than where Noah usually is, Thomas screened for Rose and as the defense collapsed toward Rose, Thomas went back on top for the pass from Rose. The defense then rotated, but Thomas swung the ball to the left wing where Brewer downed a 22 footer for an 85-74 lead with 3:29 left. No, the Celtics weren’t stealing this one. The Bulls were just too sharp and alert, if, at times, a little overenthusiastic as they did commit 21 turnovers to keep Boston in the game earlier. Yes, defense was a big difference, but this was a night your star wasn’t going to let you lose. Back home, big game against a top team after winning 14 of the last 18, but dismissed some with the run of sub-.500 teams. Plus, this was the fourth game in five nights, perhaps a time to measure a bit where this Bulls team is and what it may be. 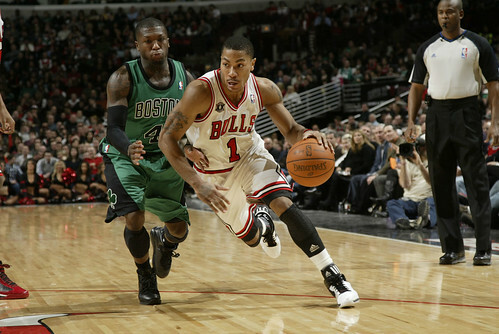 “We came in facing a good team and we played well together and proved we can beat anybody,” said Rose. Yes, just one game, but one they really needed to get though no one says those things in January. But this was about Rose and leading the way, which is what the great ones do. Rose still has that point guard mentality, which is a good thing, and he is a wonderful teammate. He worries when others are not doing well, almost feeling guilty at times because it seems so easy for him. He wants the others to feel as he does. Rose can score just about anytime he wants. I have no doubt Rose could lead the league in scoring if he wanted to. He much rather would win and see everyone happy. I’ve heard him ask at times what he can do to get other guys going better. I think that was John Farnsworth Kennedy of the Wyoming Kennedys. Anyway, the coaches have been telling Rose he is a leader and as a leader he has to get things going even if it means he does the scoring to start. 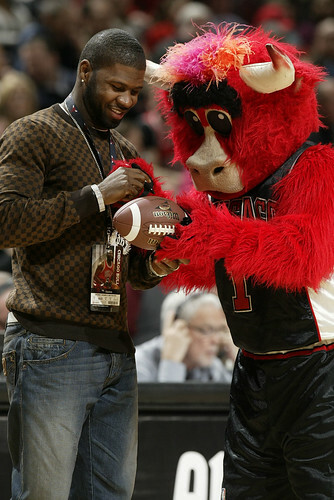 It’s one reason the Bulls have had some of these slow starting games and third quarters. Rose looks to move the ball around. If it is not going well, he takes over. Which is how the Bulls are second in most fourth quarter comeback wins. The coaches have been telling Rose they would rather have fewer comebacks and more avoiding blowing leads. So Rose came out looking more to score after the Celtics took a 17-8 early lead behind Allen’s shooting. And what do you know, there was Rose going to the free throw line. For the last two seasons, there’s been a lot of whining among the Bulls about Rose not getting foul calls given he drives so much. But Rose conceded he does go away from contact most of the time. So he said he watched more film and concentrated. Really, he is something of a basketball savant. Couldn’t shoot? Became a shooter. Couldn’t make threes? Now he’s almost 40 percent. Didn’t get to the free throw line? Rose set career records for free throws Friday and Saturday. 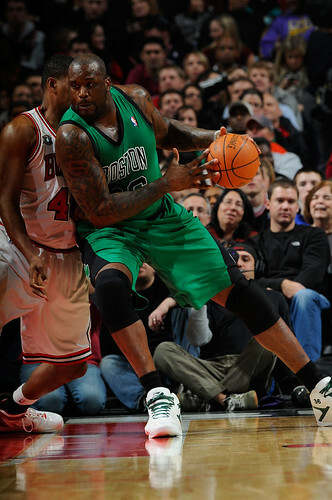 Yes, Rose took some good shots and admitted he’ll be sore from bouncing off Shaq. 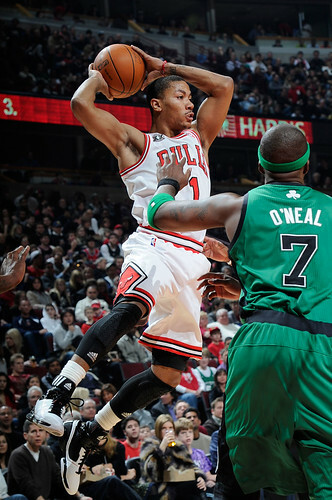 But Rose scored a dozen in the first quarter, four on free throws as the Bulls edged ahead 22-21. The Bulls hung onto a 46-42 lead at halftime as Boozer had nine points and was destroying Davis, scoring four times in five possessions on a: Beautiful baseline spin, a drop step that I thought left the Big Bag crying, a sweet little 16 foot turnaround and then a three point play on a nice pass from Korver. That run put the Bulls up 40-34 with 3:32 left in the second, but, curiously, Boozer didn’t get another shot in the quarter as sometimes the Bulls have a tendency to forget what is working and stop milking it. And no third quarter letdown this time as Rose went at the basket and at the slowly rotating Celtics, scoring 11 third quarter points with seven of 10 from the free throw line. 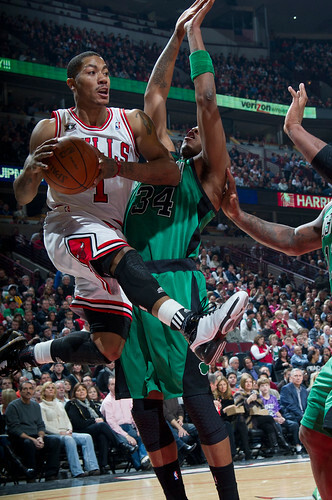 The Bulls were outscored 22-21 as the Celtics got within 67-64 after three, but Rose averted disaster this time. With the Bulls ahead 71-65 early in the fourth, Taj Gibson, who’s fallen out of the offense since Boozer has gotten going, blocked two shots on one possession as the Bulls put a demoralizing defensive series on the Celtics with Gibson getting still another block on what seemed like a sure Rondo driving basket to hold off the Celtics. And then Rose was quicker to the basket, first with those two jumpers against Shaq’s ole’ pick and roll defense and then closing it out before a raucous sold out United Center with a runner with 1:46 left as the shot clock was expiring for an 87-77 lead and then a three with 31.7 seconds left for the 13-point biggest margin of the game at 90-77. The Bulls as well? To be continued.